At Rena’s Organic® , we do everything to insure that our products are of the highest quality, every step of the way. We want you to be completely happy. That’s why we give you the opportunity to take your time and try our products, risk-free with our full 30-day 100% satisfaction guarantee. 300 MG of CBD is a perfect dosage to get started with. At Rena’s Organic®, we use only the finest quality CBD, so at any dose, you can be assured of the purity and therapeutic potency of our products. According to research, less than 200 MG. for a months supply is not a realistic dose for medicinal action. That’s why we started our line of pure Full-Spectrum, Organic, CBD Tinctures at 300 MG.
Order 300mg pure CBD oil full spectrum tincture from Rena’s Organic Shop; find relief from chronic pain, regulate blood sugar, fight inflammation, and ease anxiety. Read your labels! By checking the label and reading the fine print, you won’t get swindled into super low doses of CBD, or worse, a product that ends up consisting of only food grade Hemp and cheap oils. With Rena’s Organic®, you are sure to get the full medicinal and healing compounds that can be found in the plant. Rena’s Organic® CBD is made from pure Cannabidiol, which is the non-psychoactive component of the Cannabis plant. This is the compound in the Cannabis plant that is known to rejuvenate and heal. Rena’s Organic® 300 MG. CBD is scientifically formulated to be pure with no chemicals—no toxic “natural flavors”—just medium chain amino acid MCT oil, potent 300 MG. CBD, and a drop or two of pure, organic orange essential oil. This “miracle” plant compound has the ability to reduce or eliminate pain, especially with consistent use and in the right dosages. Rena’s Organic’s medical-grade 300 MG. CBD is a great dose to start with. If you have physical pain, we highly recommend that along with 300 MG. CBD Tincture, you apply our potent 500 MG CBD or 1000 MG. CBD topical pain relief cream to any area of your body where you feel pain. We purposely created all the Rena’s Organic® products with potent and effective strong doses, because we want you to get the results that you are longing for. No more throwing your money away on cheap products that don’t work . . . Imagine playing tennis, dancing, golfing or doing whatever you love to do and feeling great doing it?! CBD has been proven to be an effective solution to resolve and relieve pain without the horrible side effects of pharmaceuticals. How do I take Rena's Organic 300 MG CBD? The best way to take it is to simply put a few drops under your tongue. Swish it around for a moment and then swallow. This sublingual method increases absorption in the bloodstream. Is 300 MG a good potency to start with? The higher the potency with CBD, the more powerful the effect. The benefit of our premium 1500 MG CBD is that most people feel the effects instantly, even with taking just a couple of drops. Even still, 300 MG. is a great potency to start off with. Experiment to find your perfect dose. If you are sensitive, even small amounts can have a healing, energizing effect. The wonderful thing you can be assured of is that at any dose, Rena’s Organic CBD is the finest and most potent, powerful, medical grade CBD on the market. What makes Rena's Organic CBD special? For starters, we use only USA grown CBD. Some CBD out there claims to be grown in the United States, but it turns out the seeds were originally from China (because they are cheaper there). Why is that an issue? The Cannabis plant, which is the plant family that CBD is cultivated from, is a very absorbent plant. In Colorado, where our CBD is harvested, from seed to sale, there are stringent laws protecting the consumer from toxic soil and air. Our CBD is grown using strict organic farming guidelines. In parts of the world where the air and ground are full of toxins, the CBD seeds are more likely to have absorbed these impurities. That’s why we are very clear that the cultivation of our CBD in Rena’s Organic products begins and ends in the clean State of Colorado. Our CBD is organic, Full Spectrum—meaning it contains the whole plant including all the Cannabinoids, Phyto-nutrients, Anti-oxidants and Terpenes (plant essential oils). The extraction method we use is labor intensive but most effective method: Super Critical CO2 extraction. Our goal is to insure that you get the highest quality CBD on the planet, at any potency. Everybody is different. When I first tried CBD, I definitely felt more relaxed and less stressed. But the biggest surprise for me was when I went back to my Ophthalmologist, to be checked for a medical condition called: Glaucoma. My eye doctor couldn’t believe how much my eye pressures had improved since I started taking the CBD. That was when I realized I had to share this miracle plant compound with my own weight loss and wellness clients and others. People experience varying benefits—but the one thing that is so gratifying to me, is that the results people share are all positive. For some people it’s subtle and for others it’s life changing. Our customers say they have more energy, sleep sounder and need less sleep, feel much less anxious, and definitely experience a reduction in their pain (especially when they combine oral CBD with 1000 MG Organic CBD Pain Cream). I’ve tried another CBD and I didn’t feel anything. What if that happens again? I’m so glad that you are wanting to give Easy Herb Power CBD a try. I don’t know what potency you were using, but you may want to go to a higher potency, like 1500 MG CBD, or take our most powerful blend: CBD Super Cider, which is combined with other amazing organic ingredients for a very powerful effect. Since all our Rena’s Organic products are using only the highest quality CBD, even the 300 MG CBD should give you the results you are looking for (since so many products out there only contain a disappointing 100 MG CBD). The best part is that you have no risk at all. If it doesn’t work for you, it’s free. I offer a full 90-day 100% money back guarantee, less shipping. If you’re not 100% happy with your results, call or email our customer service and take advantage of our 90-day money back refund policy. What’s in 300 MG CBD? Rena’s Organic 300 MG CBD is completely pure. The powerful, organic 300 MG CBD is in a base of pure MCT (Organic Coconut) oil, with a drop of organic orange essential oil. That’s it. Our tinctures contain absolutely no fillers. There is no psycho-active component. Why didn’t I hear about CBD sooner? Though every major civilization in history respected the healing power of Hemp as a nutritional and medicinal source, CBD had been a well-kept secret in the United States since the 1930s, due to a government ban. That’s right. The government had banned Medicinal Hemp for decades, for no reason. Due to public outcry, scientific research and the urgent need in the U.S. for an affordable, non-addictive, natural alternative to pain medicine, thankfully, CBD is once again fully legal. 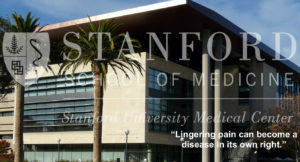 Modern research on CBD is abundant. Science is only now fully discovering what the ancients knew long ago. Chinese, Greek, Roman and Persian Civilizations utilized Hemp for its remarkable healing and medicinal properties. The efficacy of CBD is now being attributed to the newly discovered Endo-Cannabinoid System. Scientists have discovered that humans are wired with Cannabinoid receptors throughout the brain and body. These receptors are found in all bodily systems including the digestive system and the immune system. The receptors and the Cannabinoids that activate them comprise what is called the Endo-Cannabinoid System (ECS for short). The Endo-Cannabinoid receptors scientists have discovered are called CB1 and CB2. Cannabinoids supply the body with the nutrients it needs to activate the CB1 and CB2 receptors. When the body’s innate Endo-Cannabinoids activate these receptors, all bodily systems are able to communicate with each other and homeostasis—or vital balance—throughout the body occurs. CBD is a powerful Cannabinoid that mimics the bodies own Endo-Cannabinoids, thus restoring the essential balance necessary for optimal health. This is why CBD is widely sought after for its therapeutic benefit in so many areas: Insomnia, healing, pain control, anxiety relief, better immune response and improved digestion. Scientists have discovered hundreds of phytochemicals that exist in the Industrial Hemp plant. CBD or Cannabidiol comes from the Industrial or Agricultural Hemp plant. Industrial Hemp is not only rich in terpenoids and cannabinoids, but it’s full of health promoting vitamins, minerals, enzymes, polyphenols, anti-oxidants, proteins and essential fatty acids. What makes Rena’s Organic® CBD superior? At Rena’s Organic®, we don’t cut any corners. We use the best CBD you can find anywhere – guaranteed. Our CBD is grown in rural Colorado, cultivated from seed to sale, so we can vouch for its absolute purity. Rena’s Organic® CBD is always 3rd party tested and each batch comes with its own certificate of analysis. We use the best and most expensive method of extraction: Supercritical CO2, insuring the highest potency possible with no loss of nutrients. Because we are using full spectrum CBD, and not cheaper isolates, Renas Organic® CBD has a robust composition of natural Cannabinoids, phyto-nutrients and terpenes. Since we’re extracting from the whole plant, you get the tremendous added benefit of all the components of the plant working synergistically to bring healing. Our plant source insures the CBD you are getting is literally a treasure-chest full of nutrition and medicinal compounds. What’s the difference between CBD, Industrial Hemp and Cannabis? CBD is a Cannabinoid that comes from the Industrial Hemp plant. Industrial Hemp is part of the Cannabis Plant Family. Cannabis is the plant family that also produces Marijuana. THC is the compound in Marijuana that makes you “High.” With Rena’s Organic® CBD you get just the medicinal Cannabidiol (CBD), without the THC. So you get to be pain free, energized and anxiety-free, and have absolutely no psychoactive effect. No. The great news is that CBD is legal in all 50 States now, thanks to new legislation. No prescription is needed. What is CBD 300 MG? It’s a tincture, which is an herbal extract remedy. Made with only 100% organic and natural ingredients – Full Spectrum, Organic 300 MG. CBD is combined with omega-3 rich MCT Oil, and a drop of pure, organic orange essential oil. 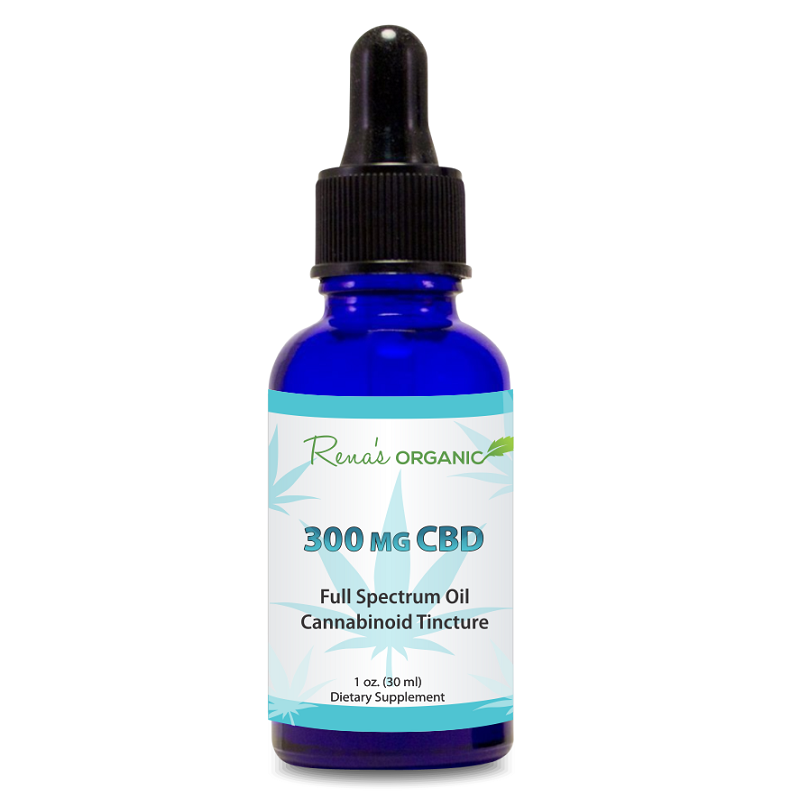 Are there any side-effects with Rena’s Organic® 300 MG CBD Tincture? The side effects are the benefits! Improved sleep, feeling more peaceful, having more sustained energy, less pain and greater concentration. No unwanted side effects have been documented with CBD, according to studies, even in large doses. That’s because the Endo-cannabinoid System has receptors in every part of the body except the brain stem. This is the center that controls breathing and heartbeat. Because there are no receptors in the brain stem, it would be impossible for these systems to shut down. What’s in it and how much should I take? We suggest starting with 1/2 dropper of 300 MG CBD taken under your tongue, 2-3 times daily. That will give you about 5 mg. CBD with each half dropper. We recommend you start with that and build up from there. Just those few drops three times a day is a great place to start. Trust your body to tell you your own perfect dose. Most people tell us that they feel the most benefit when they land on a 25-50 MG dose of Rena’s Organic® CBD per day. I am so proud and grateful to be able to bring you such a superior form of CBD—I truly believe it’s the highest quality, most potent CBD you’ll find anywhere. My quest for the last 30 years has been helping to empower people to increase their own level of health and wellness. I want you to try Rena’s Organic® CBD with no risk at all. Feel comfortable knowing that you can take it daily for 30 days risk-free. 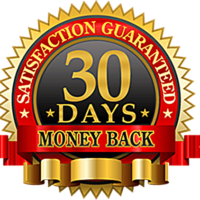 I feel confident that during these 30 days, the results will meet or exceed your expectations for vibrant health and pain relief. If you are not 100% happy for even a moment, please return it for a complete money back guarantee (less shipping). Just call or email our United States based Customer Service for your no-hassle refund. Rena Greenberg, Celebrity Health & Wellness Speaker and Coach, has been helping people lose weight and get healthy for 30 years. Since 1990, her wellness programs have been reviewed and sponsored in 75 hospitals and 100+ corporations across America, including Disney and AT&T. She is the best selling author of the Hay House book, The Right Weigh and The Craving Cure. 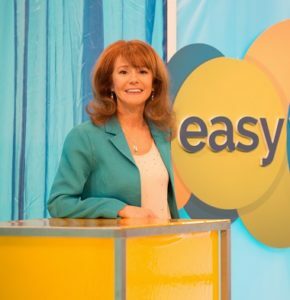 Her success has been featured in over 150 TV and newspaper stories including on CNN, Good Morning America, ABC-TV Nightline, The Doctors Show, FOX News, NBC TV, Woman’s World Magazine and her own show on PBS. A great potency for new users, Rena’s Organic 300 MG. Organic CBD is cultivated using exclusive patented genetics of the Cannabis plant to assure the highest quality possible and state of the art growing methods. Absolutely no harsh chemicals or solvents are used during the Super Critical CO2 extraction process. Studies have shown that CBD is a powerful Cannabinoid that interacts with the body’s innate Endo-Cannabinoid system to enhance immune response, energy, blood sugar, stress response and improve sleep. Disclaimer: Results vary from one person to another.